GMO Cholera Bacteria to Be Released in Australia, Canada, U.S.
Love in the Time of Cholera, written by Gabriel García Márquez is one of my favorite books of all times, but were I to be exposed to the disease and contract it, I certainly wouldn’t feel so romantically inspired. Márquez even says in the book, “There is no greater glory than to die for love,” but to die for a genetically modified bacteria? Please continue. 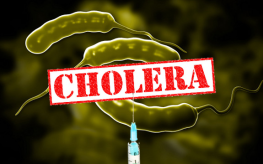 Cholera (KOL-er-a) is an illness that results from infection of the large intestine by Vibrio cholerae bacteria. It can cause watery (and deadly) diarrhea, vomiting, circulatory collapse, and shock – to such an extent that people die from it. There hasn’t been a major outbreak of cholera in the US.. since 1910, but worldwide it still affects millions of people. Now, PaxVax is looking to Australian government officials to conduct a clinical trial of a genetically modified live bacterial vaccine against cholera. The Australian Government Department of Health, Office of the Gene Technology Regulator, has received an application for a license from PaxVax to release their modified cholera bacteria on the population via vaccines. Say what? They also quote the World Health Organization as being one of their field trial supporters. Really? “During the early 1990s, the World Health Organization (WHO) had been overseeing massive vaccination campaigns against tetanus in a number of countries, among them Nicaragua, Mexico, and the Philippines. In October 1994, HLI received a communication from its Mexican affiliate, the Comite’ Pro Vida de Mexico, regarding that country’s anti-tetanus campaign. Suspicious of the campaign protocols, the Comite’ obtained several vials of the vaccine and had them analyzed by chemists. PaxVax plans an intentional release of a genetically modified cholera vaccine and we’re all supposed to be excited – even thankful for it? What is even more disturbing is that in accordance with the Gene Technology Act of 2000, the public have a minimum of 30 days to comment, but not until around late January 2015, when the ‘trials’ will likely have already begun. Several “sites” planned for the GM cholera vaccine are in Queensland, South Australia, Western Australia, & Victoria, though it’s not specified where exactly. Additional trials are planned for sites in Canada and the U.S. to make sure the vaccine is ‘safe’ in larger populations. Recently, the United Nations was under fire and is being sued for gross negligence for bringing Cholera to Haiti in the world’s worst outbreak of the bacteria. Of course, the U.N. conveniently claims to have immunity against law suits. There they go again – using the human population like guinea pigs. What can we do to stop this insanity?